Eaton Hydraulics Filtration Division acquired the Hayward Filtration division in 2005 and thus their cast Y strainer product line is equivalent to Hayward Filtrations prior to being acquired. Although acquired the cast iron, steel, bronze and 316SS Y strainer products, they subsequently sold the cast iron and bronze Y strainers to Titan. Hayward Flow Control still manufactures non-alloy filtration products, including Y strainers (PVC, CPVC, Clear PVC and PVDF). Currently Eaton's Y strainer product line consists of threaded, socket weld and ANSI flanged cast steel and 316SS Y strainers. Both threaded and socket weld designs span a range of ¼" to 2" and are 600# pressure class. 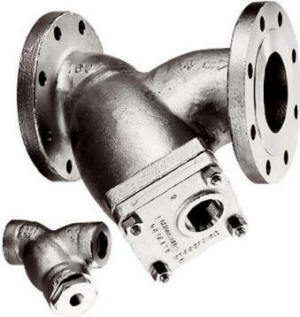 Thus Eaton carbon steel Y strainers are rated to 1480 PSIG at 100°F and the 316SS material up to 1440 PSIG at 100°F. Eaton's flanged Y strainers are available in both the 150# and 300# pressure class spanning a size range from ¾" to 10".